A whale stranded on the shores of a Nova Scotia beach was rescued thanks to the help of dozens of volunteers. The pilot whale was spotted by someone walking on the shores of Rainbow Haven Beach in Cow Bay. A woman named Nancy Briggs Carr posted a picture of the whale on Facebook. “This is at Rainbow Haven beach. My brother is there. DNR just arrived. They may need some help getting him in water. He’s still alive,” she wrote. Hundreds of people saw the message and prompted dozens of volunteers to head to the beach for a spontaneous rescue. They came equipped with blankets, shovels, and other supplies. Carr later provided an update on Facebook with photos and video of the rescue. Video footage showed the Nova Scotians pulling the whale back into the sea. 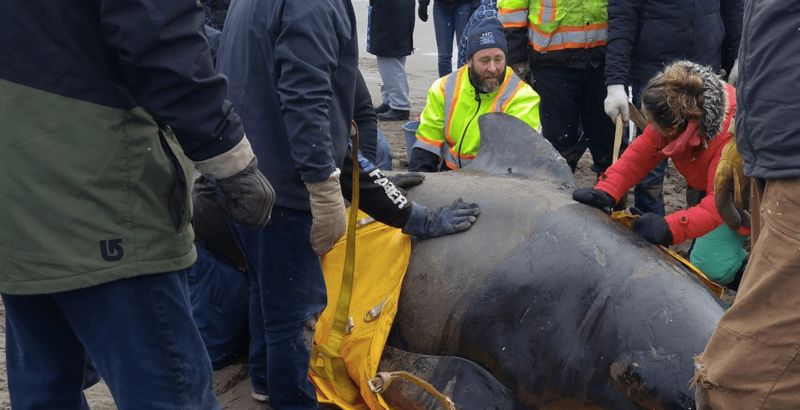 According to the Halifax-based Marine Animal Response Society (MARS) its response team was also on site to make sure the whale was guided safely back to sea.